After an opening pair of defeats, Alnmouth got back on track with victory at Gosforth, reversing a first half deficit as Sean Toal and Jonny Quinn made the scoresheet. Boh’s struck first on 15 minutes when Dan Ure cut in at the angle of the area to curl spectacularly into the top corner. Sean Toal registered the leveller early in the second period, firing in at a narrowing target after Reece Wright’s supply from Andy Murrays lay-off following Quinn’s sprayed diagonal. The winner arrived on the hour as Michael Brown did well to dispossess a defender before laying off perfectly for Quinn to power forward and side-foot past Dan Coyle. United continued to threaten but were latterly required to defend in numbers and held firm. Alnmouth: M Ashurst, M Robson, D Dawson, R Wright, J Wilkin (T Hegney), M Brown, C Stewart (P Murray), A Murray, L Ramsay, J Quinn, S Toal (C Henderson). Alnmouth travelled to Cramlington for this Wednesday night fixture and produced a split performance where they controlled the first half, creating a string of largely fruitless opportunities but struggled to maintain their cohesion after the break allowing their opponents an eventual comfortable victory with the aid of a couple of harsh decisions. Dan McDonald gave the home side an early advantage, running onto a through ball to outwit the backline and slot past Mick Ashurst. Michael Brown then levelled things up when he reacted first to find the net as ‘keeper Andrew Croney failed to hold Jonny Quinn’s thirty yard drive. Among a number of opportunities to forge ahead, Sean Toal went closest for United when striking a post but Town regained the advantage on the hour when a soft free-kick award was converted by Craig Frazer, the direct effort rebounding in off the far post. Ten minutes later the lead was doubled and the points secured as Victor Jefferson found the net from the penalty spot after Dane Dawson was penalised when the ball was driven at his arm from only a couple of yards distance. 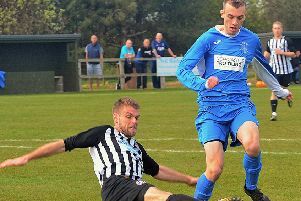 Alnmouth: M Ashurst, D Dawson, J Quinn, S Jacobsen, M Robson, L Jefferson, A Murray, M Brown, L Ramsay, R Taylor (J Wilkin) S Toal (C Stewart). Premier League - AFC Newbiggin v Northbank Carlisle; Ashington Colliers v North Shields Athletic; Birtley Town v Newcastle University; Percy Main Amateurs v Wallington; Red House Farm v Walker Central; Seaton Delaval AFC v Ponteland United; Shankhouse v Whitley Bay A. Division 1 - Cramlington Town v Hebburn Reyrolle; Cullercoats v New Fordley; Felling Magpies v Wallsend Boys Club; Gosforth Bohemians v Seaton Burn; Grainger Park FC v Gateshead Redheugh 1957; Hexham v Heaton Stannington A; Monkseaton FC v Gateshead FC A. Division 2 - Cramlington United v Blyth FC; Forest Hall v Red Row Welfare; Hazlerigg Victory v Blyth Town; Ryton and Crawcrook Albion A v Wideopen And District; Spittal Rovers v Prudhoe Youth Club FC Seniors; Whitburn Athletic v Whitley Bay Boys Club Seniors; Willington Quay Saints v Killingworth YPC.